Vegetarians have a tough time in Mongolia. Meat is sometimes the only food on offer, translating your dietary needs can prove difficult, when vegetables are available they will likely be cooked in the same pot as meat, and your diet will be seen as crazy by locals! 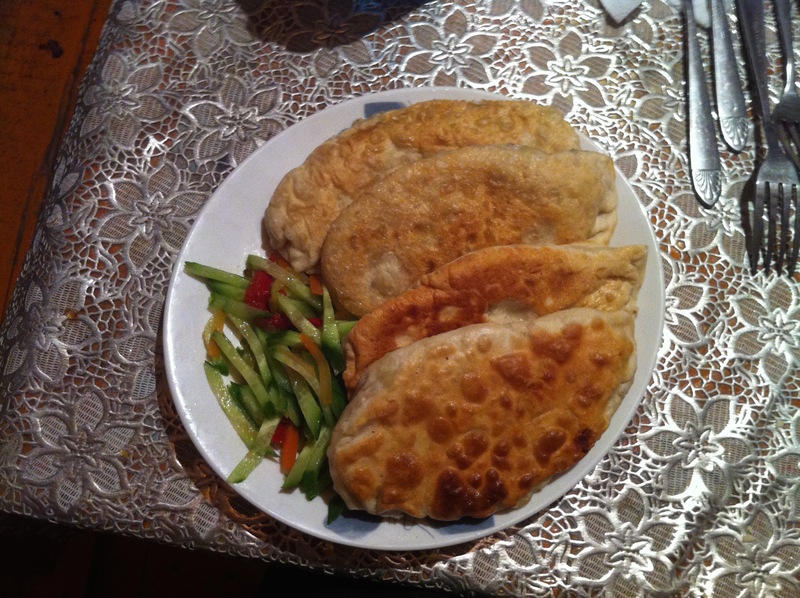 Nonetheless, travelling as a vegetarian or even a vegan in Mongolia is not impossible. Mongolians love their meat. Mutton, goat, and horse meat makes up a large part of the diet, due in part to the arid landscape, but also to the belief that meat provides vital energy, especially in the cold months. The choice to give up meat is not common here, and visiting vegetarians will face a lot of questions about what is seen as an odd and unhealthy lifestyle choice. But don’t despair! Vegetables, especially root vegetables, are available, though they may be cooked in the same pot as the meat. 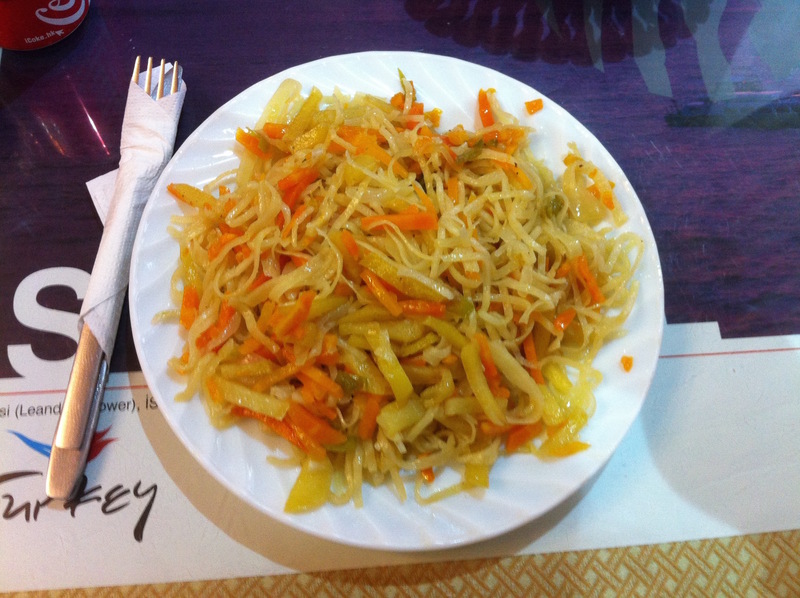 Vegetarians in Mongolia will likely rely heavily on noodles and vegetables such as potatoes, carrots, onions, and maybe the odd pepper. 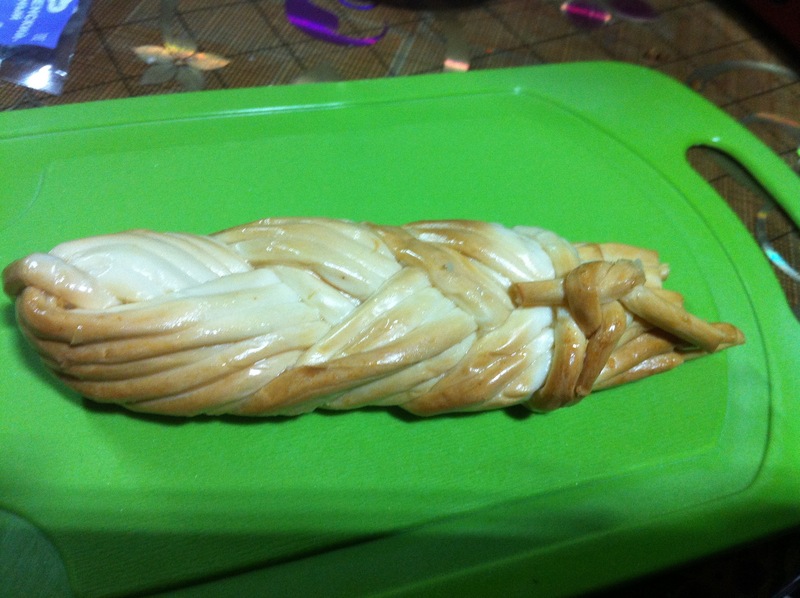 Breads are also a large part of Mongolian cuisine, especially for breakfast. Dairy is another staple in Mongolia. Bowls of milky tea are given freely in gers and houses, sometimes with sugar but more likely with salt. Creamy yoghurt is sometimes available to spread on bread rolls for breakfast. Thick butter is also on offer, though this is traditionally prepared in an intestine. For a country that loves its dairy, cheese is disappointingly absent, except for utsan byaslag, strings of yummy smoked cheese, and aaruul, dried curds that turn rock hard and can be almost impossible to eat! While most Mongolians do not speak English, they tend to make a real effort to understand people who are trying to get their message across. “Noghoon khoolton” is Mongol for “vegetarian”, though the concept of vegetarianism may still be lost on some people here, and it may be better to say “bi makh id deg gui” (“I don’t eat meat”). Pronunciation takes some practise, so it may be useful to write it in Mongol on a slip of paper and show the phrase to people to ensure you’re understood. The Mongol word for meat is “makh“, and saying “no makh” and frantically shaking my head has worked pretty well! Staying in a ger with a local family is a wonderful part of travelling in Mongolia. Meat is firmly on the menu for dinner, however. If you manage to get your point across, you will likely be given vegetables taken from a meat stew, or meat-and-noodle soup that has the meat removed. If you’re not comfortable with this, it’s best to make this clear early on, or to eat elsewhere. 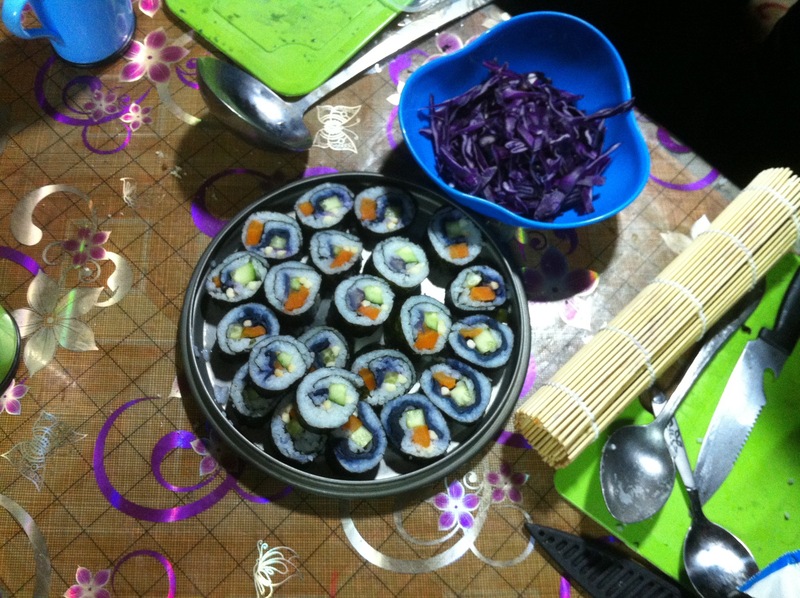 In Ulaanbaatar, all types of food are available, including vegetarian and vegan. 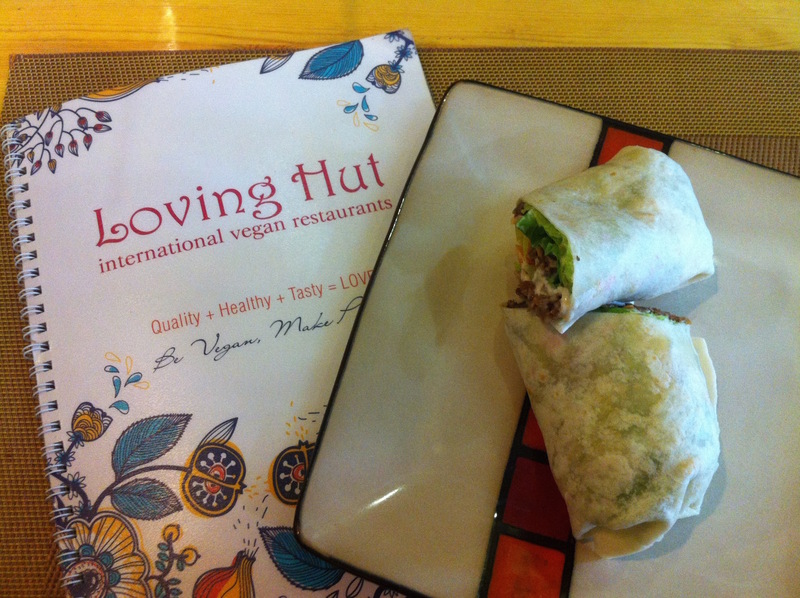 Loving Hut is a popular vegan chain of restaurants, with many locations throughout the city, serving a range of dishes including incredibly realistic tasting soy meat. In other towns and cities, restaurants may not have a vegetarian option, but will usually cook you a meal without meat if you ask. Menus are usually in Mongol only, but will often have pictures of the food. Pointing to a dish and clarifying that you don’t want makh will usually turn out fine. Small restaurants and stalls, particularly those you will encounter in the middle of nowhere during long journeys, will usually have just one thing on offer, and that thing will likely be meat dumplings, meat and noodle soup, or kuushuur (fried pancakes with mutton). These pancakes can be made without the mutton if you ask, though they will be fried in the same oil. Make sure you have a stash of snacks for these occasions. Or better yet, stock up on a few cartoons of instant noodles from a supermarket, and ask for some hot water. 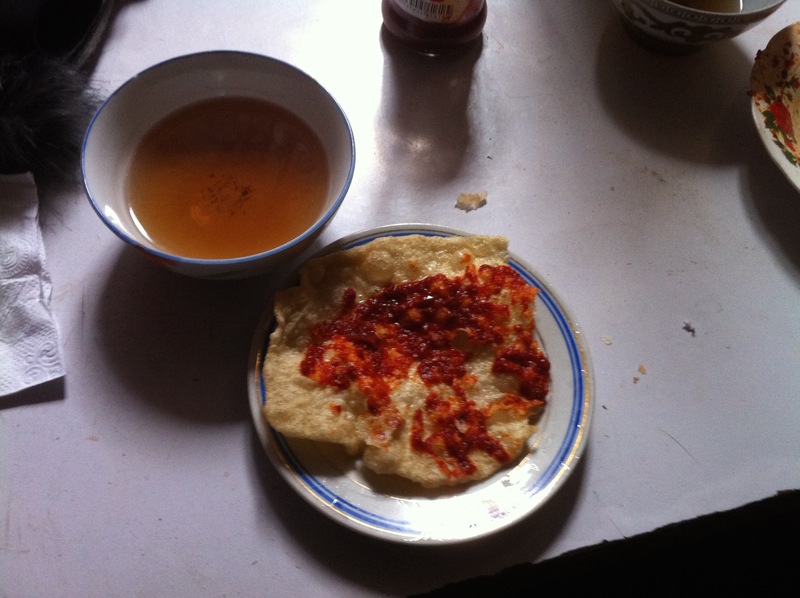 Some hostels in UB provide a kitchen for guests, such as the Golden Gobi (a personal favourite). Tours and camping trips will cater for their guests’ needs, or allow the option for you to bring food and a stove and cook for yourself. 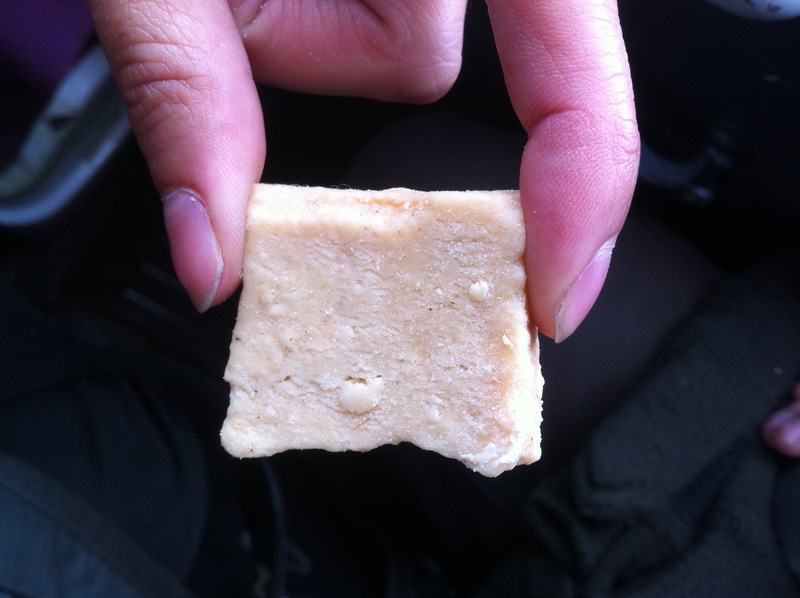 Bringing your own food is a good option if you are travelling outside of larger towns and cities, especially if you aren’t comfortable with your food being cooked with meat.